I had honor to own one of best middle-class watches. With that kind of experience I could recognize every nuance of them. And what happened when The Seiko “Black Monster” was given to my hands? I liked everything in it. Saying in few words, I was fascinated. Every true man should take a look at it. It put a “must-have” sign above it, because it one of the best quality and price combination when we are talking about automatic dive watches. Some even are saying that that watch and it’s brothers (Orange, Blue or Yellow Monster) are making a legend. And I cannot disagree with that. I will try to explain that to you! The Black Monster has 316L stainless steel 43mm case and inside of it are working 7S26 21 jewel mechanical movement. Some of you maybe will say it is not the best movement in the galaxy, but let be a realist. For that price tag it is wonderful, as we know that the accurate is quite good also – 15sec +/- daily. One more thing to notice before buying it, that this movement is not manually windable, so you have to wear it every day or use programmable watchwinder, in order to avoid resetting the time/day/date. Seiko Black Monster has mineral glass crystal, which is scratch resistant. At this point I would be even happier if Seiko would used sapphire crystal, but well, this one is well enough. All Monster series watches are well-know for torchlight lume. 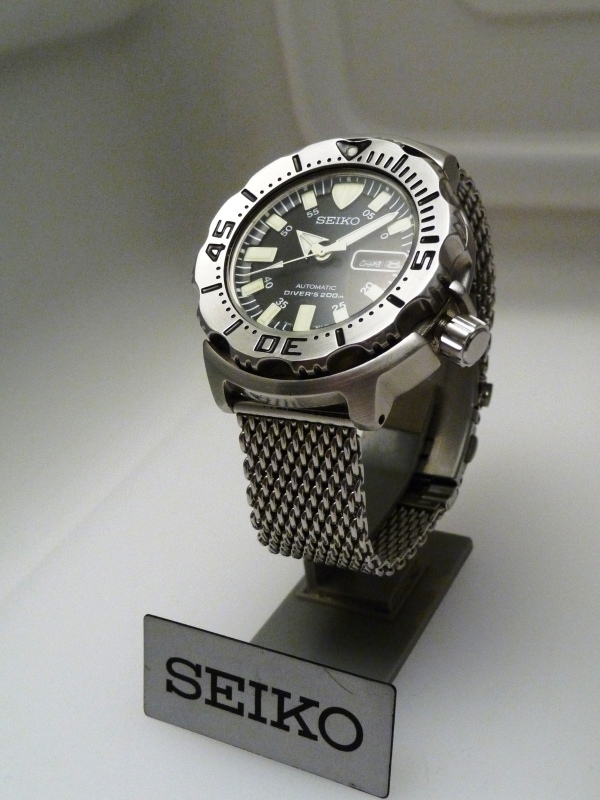 It makes this watch exclusive from other diver watches. Seiko offers you to buy this Monster with stainless steel bracelet or rubber strap. I preferred the first one. It is great looking bracelet with triple safety and wetsuit deployment clasp. The previuos feature is very rarely on that price watches, what is one more plus to buy this watch. And what about comfort? Black Monster is heavy one and you feeling solid while wearing it. In my case I have no hesitation wearing it on every occasion and day. It doesn’t matter if you are going to trip or to job. It suits perfectly with everything! I also have to mention, that mainly these models are manufactured Japan, so you should be sure about the quality of the watch and even forgot what the warranty is. You can buy this watch for less than 200 dollars and this maybe is the biggest advantage of Seiko Black Monster, because it is one of the best watch for that price tag. This entry was posted in Uncategorized and tagged Seiko, Seiko Black Monster, watch review on April 26, 2013 by admin.